Throughout history, women have grappled with a biological inevitability that is, literally, always top of mind: Sooner or later, they go gray. As the common wisdom goes, about 50 percent of women will be 50 percent gray by the time they turn 50. Men go gray too, of course, but they don’t seem to agonize over it the way women do (they have other worries, like baldness). In fact, according to WebMD, 75 percent of American women admit to color-treating their hair. Among men, it’s only 11 percent. In 1956, Clairol had a problem on its hands. Its new Miss Clairol “hair color bath” not only achieved natural-looking results in just one step, but women could also use it at home. The problem was the social stigmas tangled up in the practice of dyeing hair. Historically, most women who colored their locks either worked the stage or, worse, the sidewalk. The task of destigmatizing hair coloring fell to Shirley Polykoff at Foote, Cone & Belding. 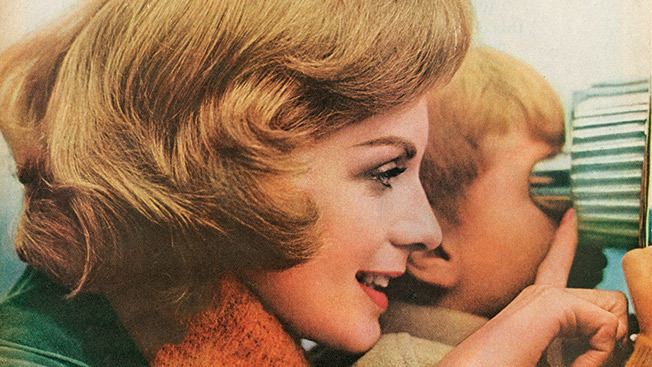 As the agency’s sole female copywriter, Polykoff understood that the key to selling Miss Clairol was to reassure its buyers that the color they’d get from that little box would be so natural, nobody would ever guess. Her tagline “Does she…or doesn’t she?” did the necessary reassuring so perfectly, it remains one of the most successful slogans in advertising history. Nope. But you have to admit, those blond locks sure look natural. Makes you wonder if she dyes her hair or not. Hmmm. Does she or doesn’t she?